The Arapaho (in French: Arapahos, Gens de Vache) are a tribe of Native Americans historically living on the plains of Colorado and Wyoming. They were close allies of the Cheyenne tribe and loosely aligned with the Lakota and Dakota. The Arapaho language, Heenetiit, is an Algonquian language closely related to Gros Ventre (Ahe/A'ananin), whose people are seen as an early offshoot of the Arapaho. Blackfeet and Cheyenne are the other Algonquian-speakers on the Plains, but their languages are quite different from Arapaho. By the 1850s, Arapaho bands formed two tribes: the Northern Arapaho and Southern Arapaho. Since 1878 the Northern Arapaho have lived with the Eastern Shoshone on the Wind River Reservation in Wyoming and are federally recognized as the Arapahoe Tribe of the Wind River Reservation. The Southern Arapaho live with the Southern Cheyenne in Oklahoma. Together their members are enrolled as the federally recognized Cheyenne and Arapaho Tribes. The Arapaho autonym is Hinono'eino or Inun-ina (“our people” or “people of our own kind”), when referring to the tribe they use Hinono'eiteen (Arapaho Nation). They were also known as Hitanwo'iv or Hetanevoeo/Hetanevo'eo'o (“People of the Sky” or “Cloud People”) by their Cheyenne allies or Mahpíyato (“Blue Cloud Men”) by Dakota, Maȟpíya thó (“Blue Sky People”) by Lakota and Assiniboine. The Caddo (Toniibeenenno' or Toniibeeneseino' - “pierced nose People”) called them Detseka'yaa, the Wichita (Hinosouno' ) Nia'rhari's-kûrikiwa'ahûski, and the Comanche Saria Tʉhka / Säretika (Sata Teichas), all names signifying “dog-eaters”. To Pawnee and Ute and other tribes they were also known as “dog-eaters”. 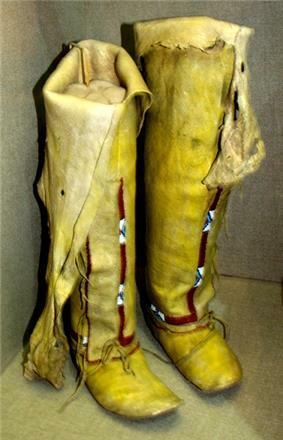 The Northern Arapaho who called themselves Nank'haanseine'nan or Nookhose'iinenno ("white sage men") were known as Baantcline'nan or Bo'oociinenno' ("red willow men") to the Southern Arapaho, whereas the latter were called by their northern kin Nawathi'neha or Noowunenno' ("Southerners"). The Northern Arapaho were also known as BSakuune'na' (Bee'eekuunnenno') ("blood-soup men"). The Cheyenne adapted the Arapaho terms and referred to the Northern Arapaho as Vanohetan or Vanohetaneo/ Váno'étaneo'o (“Sage (Brush) People”) and to the Southern Arapaho as Nomsen'nat or Nomsen'eo (“Southerners”). Nanwacinaha'ana, Nawathi'neha (“Toward the South People”) or Nanwuine'nan / Noowo3iineheeno' (“Southern People”), their now extinct language dialect - Nawathinehena - was the most divergent from the other Arapaho tribes. Hánahawuuena, Hananaxawuune'nan or Aanû'nhawa (“Rock Men” or “Rock People”), occupying territory adjacent to, but further north of the Nanwacinaha'ana, spoke the now extinct Ha'anahawunena dialect. Beesowuunenno', Baasanwuune'nan or Bäsawunena (“Big Lodge People” or “Brush-Hut/Shelter People”), resided further north of the Hinono'eino, their war parties used temporary brush shelters like the dome-shaped shade or Sweat lodge of the Great Lakes Algonquian peoples, they are said to have left more recently their old homes than the other Arapaho tribes (Note: many people say their name actually means “Great Lakes People” or “Big Water People”), they spoke the now extinct Besawunena (Beesoowuuyeitiit - “Big Lodge/Great Lakes language”) dialect. Haa'ninin, A'aninin or A'ani (“White Clay People” or “Lime People”), the northernmost tribal group that would retain their ethnic distinctiveness as the historic Gros Ventre or Atsina (Atsíína - “like a Cree, i.e. enemy” in Blackfoot (Ni'tsiitapipo'ahsin or Nitsipussin), also called Piik-siik-sii-naa - “snakes, i.e. enemies”), after the division their kin, the other Arapaho peoples, who considered them inferior, called them Hitúnĕna or Hittiuenina (“Begging Men”, “Beggars”, or more exactly “Spongers”), they speak the nearly extinct Gros Ventre (Ananin, Ahahnelin) language dialect (called by the Arapaho: Hitouuyeitiit - “Begging Men Language”), there is evidence that the southern Haa'ninin tribal group, the Staetan band, together with bands of the later political division of the Northern Arapaho, spoke the Besawunena dialect. Before their historic geo-political ethnogensis, each tribal-nation had a principal headman. The exact date of the ethnic fusion or fission of each social division is not known, but elders state that the Hinono'eino (“Arapaho proper”) and Beesowuunenno' (“Big Lodge People” or “Brush-Hut/Shelter People”) fought over the tribal symbols - the sacred pipe and lance. 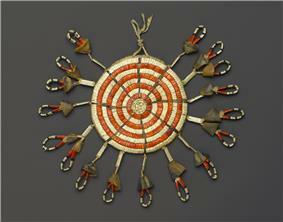 Both sacred objects traditionally were kept by the Beesowuunenno' . The different tribal-nations lived together and the Beesowuunenno' have dispersed for at least 150 years among the former distinct Arapaho tribal groups. By the late eighteenth century the four divisions south of the Haa'ninin (“White Clay People” or “Lime People”) or Gros Ventre (Atsina) consolidated into the Arapaho, so that only the Arapaho and Gros Ventre (Atsina) were recognized as separate tribal-nations. Northern Arapaho or Nank'haanseine'nan (“Sagebrush People”), Nookhose'iinenno (“White Sage People”); are called by the Southern Arapaho Bo'ooceinenno' or Baachinena (“red willow men”); the Kiowa know them as Tägyäko (“Sagebrush People”), a translation of their proper name. They keep the sacred tribal articles, and are considered the nucleus or mother tribe of the Arapaho, being indicated in the Plains Indian Sign Language (Bee3sohoet) by the sign for “mother people”. They absorbed the historic Hánahawuuena and Beesowuunenno' . There are still about 50 of Beesowuunenno'-lineage among the Northern Arapaho, and perhaps a few with the other two main divisions. Southern Arapaho, Náwunena or Noowunenno' (“Southern People”), are called by the Northern Arapaho Nawathi'neha (“Southerners”); the Kiowa know them as Ähayädal, the (plural) name for the wild plum. The sign for the Southern Arapaho is made by rubbing the index finger against the side of the nose. They absorbed the historic Nanwuine'nan / Noowo3iineheeno' (“Southern People”) and some Beesowuunenno' . The ancestral Arapaho speaking people (Heeteinono'eino' ) lived in the western Great Lakes region along the Red River Valley in what is present day Manitoba and Minnesota around 3000 years ago. In the Great Lakes region, the Arapaho were an agricultural people who grew crops including maize. Together with the early Cheyenne people (Hitesiino') the Arapaho were pushed westward onto the eastern Great Plains by the Ojibwe who were numerous and obtained guns earlier from their French allies. The ancestors of the Arapaho people entered the Great Plains from the western Great Lakes region sometime before 1700. During their early history on the plains the Arapaho lived on the northern plains from the South Saskatchewan River in Canada south to Montana, Wyoming, and western South Dakota. Before the Arapaho acquired horses, they used domestic dogs as pack animals to pull their travois. Horses were first acquired in the early 1700s by the Arapaho and became central to their way of life as a nomadic people. The introduction of the horse to Arapaho society allowed them to pull greater loads, hunt more meat, hunt easier, travel faster, and travel farther. Gradually, the Arapaho moved farther south, split into the closely allied Northern and Southern Arapaho, and established a large joint territory spanning land in southern Montana, most of Wyoming, the Nebraska Panhandle, central and eastern Colorado, western Oklahoma, and extreme western Kansas. A large group of Arapaho split from the main tribe and became their own independent people commonly known as the Gros Ventre or Atsina. The name Gros Ventre meaning “Big Bellies” in French was a misinterpretation of sign language between an Indian guide and French explorers. The Gros Ventre spoke a similar language to the Arapaho after the division and referred to themselves as A'aninin meaning ″White Clay people″. The Arapaho often viewed the Gros Ventre as inferior and referred to them as Hitúnĕna or Hitouuteen, meaning "beggars". Once established, the Arapaho began to expand their presence on the plains through trade, warfare, and alliances with other plains tribes. 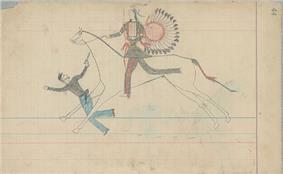 Around 1811 the Arapaho made an alliance with the Cheyenne (Hítesííno’ - ″scarred one″). Their strong alliance with the Cheyenne allowed the Arapaho to greatly expand their hunting territory. By 1826, the Lakota, Dakota, Cheyenne, and Arapaho pushed the Kiowa (Niiciiheihiinenno'; Kiowa tribe: Niiciiheihiiteen) and invading Comanche south. Conflict with the allied Comanche and Kiowa ended in 1840 when the two large tribes made peace with the Arapaho and Southern Cheyenne and became their allies. 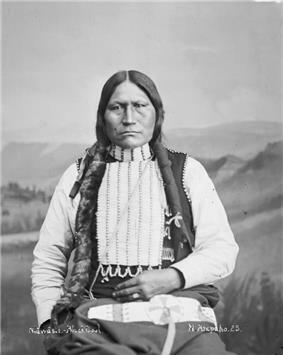 Chief Little Raven was the most notable Arapaho chief that helped mediate peace among the nomadic southern plains tribes and would retain his reputation as a peace chief throughout the Indian Wars and reservation period. The alliance with the Comanche and Kiowa led to the most southern of the Arapaho bands being able to enter the Llano Estacado in the Texas Panhandle. One band of Southern Arapaho became so closely allied with the Comanche that they were absorbed into the tribe, adopted the Comanche language, and became their own band of Comanche known as the Saria Tʉhka (Sata Teichas) or Dog-Eaters band. They had active trade relationships with the farming villages of the Arikara, Mandan, and Hidatsa on the Missouri, trading them excess meat and hides for corn squash and beans. The Arikara called them "Colored Stone Village (People)" possibly because gemstones from the Southwest were among the trade items. The Hidatsa called them E-tah-leh or Ita-Iddi (″Bison-Path People″). Conflict with Euro-American traders and explorers was light, and the Arapaho freely entered various trading posts and trade fairs to exchange mostly bison hides and beaver furs for European goods such as firearms. The Arapaho frequently came into contact with fur traders in the foothills of the Rocky Mountains, and the headwaters of the Platte and Arkansas and became well-known traders on the plains and bordering Rocky Mountains; the name ″Arapaho″ may have come from the Pawnee word Tirapihu (or Larapihu), probably applied to the tribe from the fact that they were the trading group in the Great Plains region for he buys or trades or traders. Another source for their tribal name could be, that the white traders referred to them by their Crow (Apsáalooke aliláau) name Alappaho' which meant "People with many tattoos". The Arapaho had tattooed small circles on their bodies. The traders' pronunciation of Alappaho' soon led to the widespread use of the name Arapaho. A large part of Arapaho society was based around the warrior, which most young men strived to, but were not obligated to become. After the introduction of the horse the Arapaho quickly became master horsemen and highly skilled at fighting on horseback. 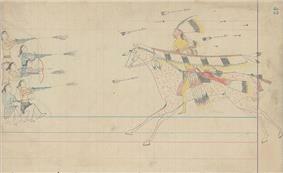 The role of the warrior in Arapaho society was much more than just combat. Warriors were expected to keep peace among the camps, provide food and wealth for their families, and guard the camps from attacks. Like other plains Indians including their Cheyenne allies the Arapaho have a number of distinct military societies. Each of the eight Arapaho military societies had their own unique initiation rites, pre and post battle ceremonies and songs, regalia, and style of combat. Unlike their Cheyenne, Lakota, and Dakota allies, the Arapaho military societies were age based. Each age level had its own society for prestigious or promising warriors of the matching age. As the warriors aged they may graduate to the next society. Warriors often painted their face and bodies with war paint as well as their horses for reasons of empowerment. Each warrior had a unique design for their war paint they often wore into battle. Feathers from birds, particularly eagle feathers, were also worn in to battle as symbols of prestige and for reasons similar to war paint. Before setting out for war the warriors organized themselves into war parties. War parties were made up of individual warriors and a selected war chief. The title of war chief must be earned through a specific number of acts of bravery in battle known as Counting coup. Coups may include stealing horses unseen, touching a living enemy, or stealing a gun from an enemy’s grasp. Arapaho warriors used a variety of weapons including war-clubs, lances, knives, tomahawks, bows, shotguns, rifles, and pistols. Guns were acquired through trade at trading posts or trade fairs in addition to raiding soldiers or other tribes. The Arapaho fought with the Pawnee (Hooxeihiinenno' - "wolf people"), Omaha (Howohoono' ), Ho-chunk, Osage (Wosootiinen, Wosoo3iinen or Wosoosiinen), Ponca (same as Omaha: Howohoono' ), and Kaw (Honoho' ) east of their territory. North of Arapaho territory they fought with the Crow (Houunenno' ), Blackfoot Confederacy (Woo'teenixteet or Woo'teenixtee3i' - ″people wearing black-feet″), Gros Ventre (Hitouunenno' , Gros Ventre tribe: Hitouuteen), Flathead (Kookee'ei3i' ), Arikara (Koonoonii3i ' - ″people whose jaws break in pieces″), Iron Confederacy (Nehiyaw-Pwat) (Assiniboine (Nihooneihteenootineihino' - "yellow-footed Sioux"), Plains/Woods Cree (Nooku(h)nenno '; Plains Cree tribe: Nookuho' - "rabbit people"), Saulteaux (Plains Ojibwa) and Nakoda (Stoney)). To the west they fought with eastern Shoshone (Sosoni'ii; Shoshone tribe: Sosoni'iiteen) and the Ute (Wo'(o)teenehi3i' - ″cut throats″; Ute tribe: Wo'(o)teennehhiiteen). South of their territory they occasionally fought with the Navajo (Coohoh'oukutoo3i' - ″those who tie their hair in back of the head or in bunches″), Apache (Coo3o' - "enemy" or Teebe'eisi3i' - "they have their hair cut straight, hanging straight down", Ti'iihiinen - "killdeer people" refers especially to Jicarilla Apache) and various Pueblo peoples (Cooh'ookutoo3i' - "they tie their hair in a bundle"). The Cheyenne (Hitesiino' ), Sioux (Nootineihino' ), Kiowa (Niiciiheihiinenno' - ″river people″ or Koh’ówuunénno’ - ″creek people″; Kiowa tribe: Niiciiheihiiteen or Koh’ówuunteen), Plains Apache (3oxooheinen - "pounder people"), and Comanche (Coo3o' - sg. and pl., means: "enemy", like Apache) were enemies of the Arapaho initially but became their allies. Together with their allies the Arapaho also fought with invading US soldiers, miners, and settlers across Arapaho territory and the territory of their allies. 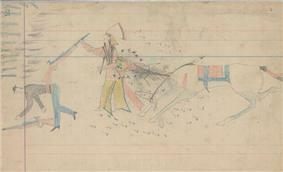 Ledger drawing of a scene from the massacre by Cheyenne eyewitness and artist Howling Wolf. 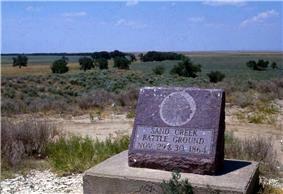 Present day marker of the Sand Creek Massacre site in Kiowa County Colorado. Upon arrival at Fort Lyon, Chief Left Hand and his followers were accused of violence by Colonel Chivington. Chief Left Hand and his people got the message that only those Indians that reported to Fort Lyon would be considered peaceful and all others would be considered hostile and ordered killed. Confused, Chief Left Hand and his followers turned away and traveled a safe distance away from the Fort to camp. A traitor gave Colonel Chivington directions to the camp. He and his battalion stalked and attacked the camp early the next morning. Rather than heroic, Colonel Chivington's efforts were considered a gross embarrassment to the Cavalry since he attacked peaceful elders, women and children. As a result of his war efforts, instead of receiving the promotion to which he aspired, he was relieved of his duties. Eugene Ridgely, a Cheyenne–Northern Arapaho artist, is credited with bringing to light the fact that Arapahos were among the victims of the massacre. His children, Gail Ridgely, Benjamin Ridgley and, Eugene "Snowball" Ridgely, were instrumental in having the massacre site designated as a National Historic Site. In 1999, Benjamin and Gail Ridgley organized a group of Northern Arapaho runners to run from Limon, Colorado, to Ethete, Wyoming, in memory of their ancestors who were forced to run for their lives after being attacked and pursued by Colonel Chivington and his battalion. Their efforts will be recognized and remembered by the "Sand Creek Massacre" signs that appear along the roadways from Limon to Casper, Wyoming, and then to Ethete. The events at Sand Creek sparked outrage among the Arapaho and Cheyenne resulting in three decades of war between them and the United States. Much of the hostilities took place in Colorado leading to many of the events being referred to as part of the so-called Colorado War. Battles and hostilities elsewhere on the southern plains such as in Kansas and Texas are often included as part of the “Comanche Wars”. During the wars the Arapaho and Cheyenne allies the Kiowa, Comanche, and Plains Apache would participate in some battles alongside them. The Lakota from the north came downwards into northern Colorado to help the Arapaho and Cheyenne there. The Battle of Julesburg resulted from a force of about 1000 allied Northern Arapaho, Cheyenne (mostly from the Dog Soldiers warrior society), and Lakota from the Brulé and Oglala sub-tribes. The point of the raid was retaliation for the events at the Sand Creek Massacre months earlier. The allied Indian forces attacked settlers and US Army forces around the valley of the South Platte River near Julesburg, Colorado. The battle was a decisive Indian victory resulting in 14 soldiers and 4 civilians dead and probably no Indian casualties. A force of around 3000 Southern Arapaho, Northern Cheyenne, and Lakota attacked soldiers and civilians at a bridge crossing the North Platte River resulting in the Battle of Platte Bridge. The battle was another victory for the Indians resulting in 29 soldiers killed with at least 8 Indian casualties. Arapaho, Cheyenne, Comanche, Kiowa, and Plains Apaches seeking peace were offered to sign the Medicine Lodge Treaty in October 1867. The treaty allotted the Southern Arapaho a reservation with the Southern Cheyenne between the Arkansas and Cimarron rivers in Indian Territory (present-day Oklahoma). Among those that signed the treaty was Chief Little Raven. Those that did not sign the treaty were called “hostile” and were continually pursued by the US Army and their Indian scouts. The last major battle between the Arapaho and the US on the southern plains was the Battle of Summit Springs in northernmost Colorado. The battle involved a force of around 450 Arapaho, Cheyenne, and Lakota warriors and 244 US soldiers and around 50 Pawnee scouts under Frank North. The most prominent Indian leader at the battle was Tall Bull, a leader of the Dog Soldiers warrior society of the Cheyenne. The battle was a US victory resulting in around 35 warriors killed (including Tall Bull) and a further 17 captured. The soldiers suffered only a single casualty. The death of Tall Bull was a major loss for the Dog Soldiers. After the Sand Creek Massacre and a number of other skirmishes the Northern Arapaho, Cheyenne, and Lakota moved many of their bands to the remote Powder River country in Wyoming and southern Montana. Along the way they participated in the Battle of Mud Springs, a minor incident in the Nebraska Panhandle involving a force of between 500 and 1,000 Arapaho, Cheyenne, and Lakota warriors and 230 US soldiers. The battle resulted the capturing of some army horses and a herd of several hundred cattle with a single US casualty. An attempt was made by the army to recapture their stolen livestock and attack the Indians which resulted in the Battle of Rush Creek. The battle was inconclusive, resulting in only one Indian casualty and three US soldiers dead (with a further eight wounded). Lt. Col. William O. Collins, commander of the army forces stated that pursuing the Indian forces any further through the dry Sand Hills area would be "injudicious and useless." Once in the area of the Powder River the Arapaho noticed an increase in travelers moving along the established Bozeman trail, which led to the Montana gold fields. Settlers and miners traveling on the Bozeman Trail through the Powder River country were viewed as threats by the Indians as they were numerous and were often violent towards encountered Indians and competed for food along the trail. Hostilities in the Powder River area led to Major General Grenville M. Dodge to order the Powder River Expedition as a punitive campaign against the Arapaho, Lakota, and Cheyenne. The expedition was inconclusive with neither side gaining a definitive victory. The allied Indian forces mostly evaded the soldiers except for raids on their supplies which left most soldiers desperately under equipped. The most significant battle was the Battle of the Tongue River were Brigadier General Patrick Edward Connor ordered Frank North and his Pawnee Scouts to find a camp of Arapaho Indians under the leadership of Chief Black Bear. Once located Connor sent in 200 soldiers with two howitzers and 40 Omaha and Winnebago and 30 Pawnee scouts, and marched that night toward the village. Indian warriors acting as scouts for the US Army came from the Pawnee, Omaha, and Winnebago tribes who were traditional enemies of the Arapaho and their Cheyenne and Lakota allies. With mountain man Jim Bridger leading the forces they charged the camp. Most of the Arapaho warriors were gone on a raid against the Crow and the battle was a US victory resulting in 63 Arapaho dead, mostly women and children. The few warriors present at the camp put up a strong defense and covered the women and children as most escaped beyond the reach of the soldiers and Indian scouts. After the battle the soldiers burned and looted the abandoned tipis. Connor singled out four Winnebago, including chief Little Priest, plus North and 15 Pawnee for bravery. The Pawnee made off with 500 horses from the camps herd as payback for previous raids by the Arapaho. The Arapaho were not intimidated by the attack and launched a counterattack resulting in the Sawyers Fight where Arapaho warriors attacked a group of surveyors resulting in three dead and no Arapaho loses. 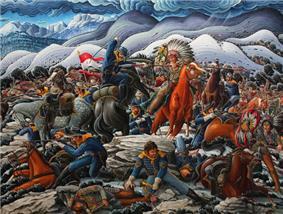 Painting of the Fetterman Fight by Kim Douglas Wiggins. Red Cloud’s War was a war fought between soldiers of the United States and the allied Lakota, Northern Cheyenne, and Northern Arapaho between 1866 and 1868. The war was named after the prominent Oglala Lakota chief Red Cloud who led many followers into battle with the invading soldiers. The war was a response to the large number of miners and settlers passing through the Bozeman Trail, which was the fastest and easiest trail from Fort Laramie to the Montana gold fields. The Bozeman Trail passed right through the Powder River Country which was near the center of Arapaho, Cheyenne, Lakota, and Dakota territory in Wyoming and southern Montana. The large number of miners and settlers competed directly with the Indians for resources such as food along the trail. The most significant battle during Red Cloud’s War was the Fetterman Fight also known as Battle of The Hundred in the Hand to the Indian forces fought on December 21, 1866. The Battle involved Capt. William J. Fetterman who led a force of 79 soldiers and two civilians after a group of ten Indian decoys planning on luring Fetterman's forces into an ambush. The ten decoys consisted of two Arapaho, two Cheyenne, and six Lakota. Fetterman was well known for his boastful nature and his inexperience fighting Indian warriors and despite orders to not pursue the decoys did so anyways. Famous Mountain Man and guide to the soldiers stationed at Fort Laramie Jim Bridger commented on how the soldiers “don't know anything about fighting Indians". After about a half mile pursuit the decoys signaled the hidden warriors to ambush Fetterman and his forces. Warriors from both sides of the trail charged Fetterman and forced them into nearby rocks where the battle soon became hand-to-hand combat giving the Indians the upper hand due to their skill in fighting with hand held weapons such as tomahawks and war-clubs. The Indian forces killed all of Fetterman’s infantry as well as the following cavalry with a total of 81 killed. The battle was the greatest military defeat by the US on the Great Plains until the Battle of the Little Bighorn ten years later. Red Cloud’s War ended in a victory for the Arapaho, Cheyenne, Lakota, and Dakota. 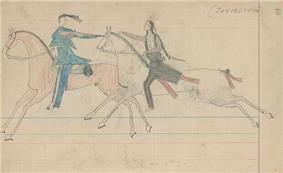 The Treaty of Fort Laramie guarantied legal control of the Powder River country to the Indians. Chief Black Coal, among the most influential Arapaho chiefs of his time. Chief Black Coal was able to largely keep the Arapaho at peace with the United States and out of the Great Sioux war of 1876. The Great Sioux War of 1876-77 also known as the Black Hills War or Great Cheyenne War was a major conflict that was fought between the Lakota Sioux, Cheyenne, and Arapaho alliance and the US Army. The war was started after miners and settlers traveled into the Black Hills area and found gold, resulting in increased numbers of Non-Indians illegally entering designated Indian lands. A large part of Cheyenne and Arapaho territory and most of Sioux territory known as the Great Sioux Reservation was guaranteed legally to the tribes by the Treaty of Fort Laramie after they defeated the US during Red Cloud's War in 1868. The Black Hills in particular are viewed as sacred to the Lakota and Dakota peoples, and the presence of settlers illegally occupying the area caused great unrest within the tribes. Instead of evicting the settlers the US Army broke the treaty and invaded Sioux, Cheyenne, and Arapaho territory in order to protect American settlers and put the allied tribes on smaller reservations or wipe them out. After Red Cloud’s War many Northern Arapaho moved to the Red Cloud Agency in Dakota Territory and lived among the Lakota as well as many Cheyenne. Among the most influential and respected Arapaho chiefs living on the Agency was Chief Black Coal who gained prominence as a warrior and leader against white settlers in the Powder River country. Other important Arapaho chiefs living in the area included Medicine Man, Black Bear, Sorrel Horse, Little Shield, Sharp Nose, Little Wolf, Plenty Bear, and Friday. The Arapaho chief “Friday” (unlikely to be his real name) was well regarded for his intelligence and served as an interpreter between the tribe and the Americans. Black Coal guaranteed to the Americans that he and his people would remain peaceful during the tense times when the settlers were illegally entering Indian land in hopes of securing recognized territory of their own in Wyoming. Many of the warriors and families that disagreed with Black Coal’s ideals drifted southward to join up with the southern division of Arapahos. Many Arapaho, particularly those in Chief Medicine Man’s band did not wish to reside among the Sioux “for fear of mixing themselves up with other tribes”. Their peaceful stance and willingness to help American soldiers strained once strong relations between them and the Lakota and Cheyenne which took an aggressive stance and fled the reservation. Attitudes towards the Arapaho from the “hostile” Lakota and Cheyenne were similar to the attitudes they had towards members of their own tribes which took similar peaceful stances and remained as “reservation Indians”. Despite their unwillingness to take up the war path the Arapaho were unwilling to cede their territory, particularly the Black Hills area which they have a strong spiritual attachment to similar to the Lakota. You have come here to speak with us about the Black Hills, and, without discussing anything that we say, and without changing anything that we say, we wish to tell the Great father [President of the United States] when you get back that this is the country in which we were brought up, and it has also been given to us by treaty by the great father. And I am here to take care of the country, and therefore, not only the Dakota [Sioux] Indians, but my people have an interest in the Black Hills that we have come to speak about today. During this time of great unrest the tribe found itself deteriorating in leadership with many chiefs holding little sway among their bands. In order to regain strength as leaders and further negotiations for land in Wyoming many chiefs and their warriors enlisted as army scouts for the United States and campaigned against their allies. Another chief considered as influential and equal to Black Coal named Chief Sharp Nose was noted as “the inspiration of the battlefield…He handled men with rare judgment and coolness, and was as modest as he was brave”. Despite their overall stance as allies for the Americans some Arapaho warriors fought against the United States in key battles during the war. Like in previous wars the US recruited Indian warriors from tribes that were enemies with the Arapaho-Cheyenne-Lakota-Dakota alliance to act as Indian scouts, most notably from the Crow, Arikara, and Shoshone. Unlike previous conflicts involving the Lakota-Dakota-Cheyenne-Arapaho alliance and the United States the Great Sioux War ended in a victory for the United States. The bison herds which were the center of life for the Indians were considerably smaller due to government supported whole-scale slaughter in order to prevent collisions with railroads, conflict with ranch cattle, and to force nomadic plains Indians to adopt reservation life living off government handouts. Decreased resources and starvation was the major reason for the surrendering of individual Indian bands and the end of the Great Sioux War. The most significant battle of the war was the  The Arapaho present were four Northern Arapaho warriors named Yellow Eagle, Yellow Fly, Left Hand, and Water Man. The fifth Arapaho was a Southern Arapaho named Well-Knowing One (Sage) but also known as Green Grass. The five Arapaho set out as a war party from near Fort Robinson to raid the Shoshone but by chance came across a small party of young Sioux warriors. The Sioux thought the Arapaho were United States Army Indian Scouts and invited them back to their camp along the Little Bighorn River where they were captured and had their guns taken from them. The Lakota and Dakota threatened to kill the Arapaho but Cheyenne chief Two Moons recognized the men as Arapaho and ordered their release. 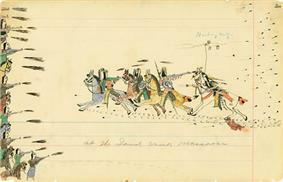 The next day was the battle and, despite being viewed with suspicion, the five Arapaho actively fought in the battle. 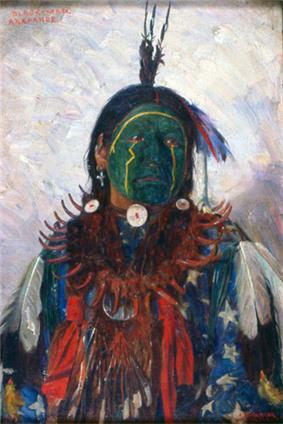 Water Man wore a large eagle feather headdress, a white shirt, beaded leggings, a breech cloth, and painted his face red and yellow during the battle. Water Man claimed killing one soldier while charging up the steep river banks but did not take his scalp because most Arapaho refused to take a scalp from someone with short hair. Water Man claimed to have watched Custer die. When I reached the top of the hill I saw Custer. He was dressed in buckskin, coat and pants, and was on his hands and knees. He had been shot through the side and there was blood coming from his mouth. He seemed to be watching the Indians moving around him. Four soldiers were sitting up around him, but they were all badly wounded. All the other soldiers were down. Then the Indians closed in around him, and I did not see any more. Most of the dead soldiers had been killed by arrows, as they had arrows sticking in them. The next time I saw Custer he was dead, and some Indians were taking his buckskin clothes. The Arapaho warrior Left Hand accidentally killed a Lakota warrior that he mistook for an Arikara scout, and despite further anger from the Lakota left the battle alive along with the other four Arapaho. After the battle the Arapaho quietly slipped away and headed back to the Fort Robinson area. In July 2005, Northern Arapahos won a contentious court battle with the State of Wyoming to get into the gaming or casino industry. The 10th Circuit Court ruled that the State of Wyoming was acting in bad faith when it would not negotiate with the Arapahos for gaming. Presently, the Arapaho Tribe owns and operates high-stakes, Class III gaming at the Wind River Casino, Little Wind Casino and 789 Smoke Shop and Casino. They are regulated by a Gaming Commission composed of three tribal members. The Northern Arapaho Tribe opened the first casinos in Wyoming. Meanwhile, the Cheyenne and Arapaho Tribes operate three casinos: the Lucky Star Casino in Clinton, the Feather Warrior Casino in Watonga, and the Feather Warrior Casino in Canton. Chief Little Raven (c. 1810–1889), negotiated peace between the Southern Arapaho and Cheyenne and the Comanche, Kiowa, and Plains Apache. He secured rights to the Cheyenne–Arapaho Reservation in Indian Territory. Chief Niwot (c. 1825–1864), led a band in Northern Colorado and died from wounds sustained during the Sand Creek Massacre. Sherman Coolidge (Runs-on-Top) (1862–1932) Episcopal minister and educator in the Wind River community who was a founding member of the Society of American Indians. ^ Wiles, Sara (2012). Arapaho Journeys: Photographs and Stories from the Wind River Reservation. University of Oklahoma Press. p. 11. ^ "Arapaho, Southern". Oklahoma Historical Society. Retrieved 2013-08-17. ^ George Hyde. Red Cloud's Folk: A History of the Oglala Sioux Indians. Norman: University of Oklahoma Press, 1937. ^ Graham, Col. William A. The Custer Myth: A Source Book for Custeriana. New York: Bonanza Books, 1953, p. 109. ^ "Water Man's Story of the Battle". 100 Voices. Retrieved 2013-08-26. ^ "Left Hand's Story of the Battle". 100 Voices. Retrieved 2013-08-26. ^ "Sherman Coolidge Biography". Friends of Nez Perce Battlefields. Retrieved 30 Sep 2012. Fowler, Loretta. Arapahoe Politics, 1851-1978: Symbols in Crises of Authority. University of Nebraska Press, 1982. ISBN 0-8032-1956-3. McDermott, John D. Circle of Fire: The Indian War of 1865. Mechanicsburg, PA: Stackpole Books, 2000. Waldman, Carl. Encyclopedia of Native American Tribes. New York: Checkmark Books, 2006. ISBN 0-8160-6273-0. Kroeber, Alfred Louis (1901). Decorative symbolism of the Arapaho. G.P. Putnam's Sons. Retrieved 24 August 2012.